The Texan's Surprise Son, is the fifth story in the Texas Rodeo Barons continuity series - a series written by different authors. Although connected with a continuing storyline, for the most part, this story stands on its own. Mariana Snow hadn't agreed with her sister. Leah had purposely gotten pregnant and withheld the knowledge of their son from Jacob Baron. Only shortly before Leah's death had Mariana learned Cody was Jacob's son. She couldn't keep Cody from his father, and came to tell Jacob the truth - and then to see what role he would choose to have in Cody's life. Not that she wouldn't be keeping an eye on this cowboy and how he interacted with Cody. The impact of learning he was a father just about equaled the impact of landing from a bucking bull. Probably more stunning. Jacob wasn't a pushover though, and he intended to know for certain that Cody was his son. From the moment he saw Cody, he could feel the connection. Similar to the connection he felt for the boy's aunt. But trying to get through Mariana's walls was going to be a challenge. And challenges were Jacob's specialty. He'd been fighting to gain his step-father's respect for advancement in the family's business, he battled on the back of bulls. Now he would win Mariana's heart. 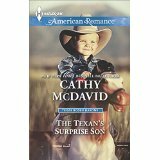 The Texan's Surprise Son was a fun addition to the Texas Rodeo Barons continuity series. I couldn't believe Leah had done this to Jacob, and truly appreciated the difficult position that Mariana found herself in. She loved her sister, but she knew what her sister had done was wrong - and she now had to face the consequences. A man would learn he had been tricked into parenting a child, then that child had been kept from him. He could hold this against Mariana and her mother, but thankfully, Jacob is a hero who would never do such a thing. I look forward to the final story in this series.